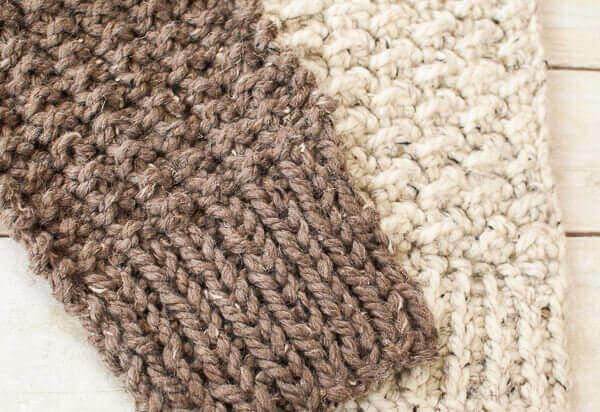 This Quick and Comfy Crochet Scarf Pattern is exactly as it sounds … it’s quick to work up and super comfy to wear! 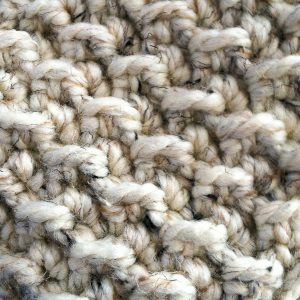 The stitch pattern I used gives it a great textured design and is perfect for adding style to an outfit while keeping cozy! And if you prefer a knit version of the scarf, I have one too … just click here for the free Quick and Comfy Knit Pattern. Add this pattern to your Ravelry library by clicking here. Finished scarf measures approximately 6 ½ in. × 33 in. 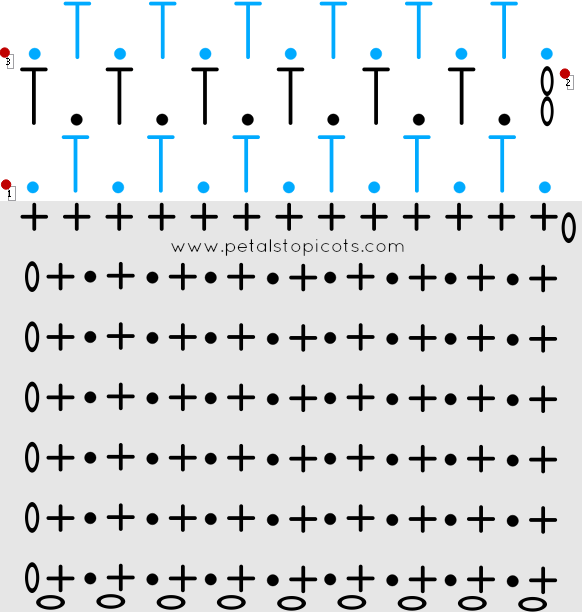 Row 1 (RS): Work 1 sc in 2nd ch from hook and each ch across, turn — 6 sts. Row 2: Sl st in each st across, turn — 6 sts. Row 3 (RS): Ch 1 (does not count as st), work 1 sc in each st across, turn — 6 sts. Rows 4 through 17: Repeat Rows 2 and 3, do not turn after last row. With the right side (RS) facing you, chain 1 and work 13 sc evenly across side edge of ribbing rows. Row 1: Sl st in first st, *1 hdc in next ch, Sl st on next, rep from * across, turn — 13 sts. Row 2 (RS): Ch 2 (counts as 1st hdc), *Sl st in next hdc, 1 hdc in next Sl st, rep from * across, turn — 13 sts. Row 3: *Sl st in hdc, 1 hdc in next Sl st, rep from * across, Sl st in top of turning ch, turn — 13 sts. 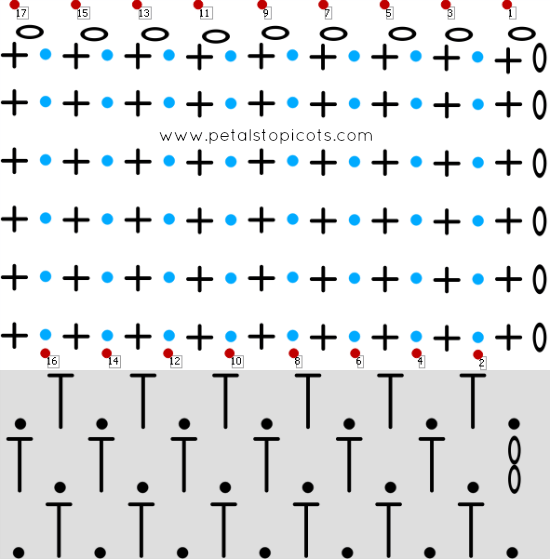 Rows 4 – 57 : Rep Rows 2 and 3 for pattern through Row 57 or until desired length is reached being being sure to end on an odd numbered (WS) row, do not fasten off. Row 1 (RS): Work 1 sc in 2nd ch from hook and each ch across, drop loop from hook and pull through adjacent st along last row of scarf, turn — 6 sts. Row 3 (RS): Ch 1 (does not count as st), work 1 sc in each st across, drop loop from hook and pull through adjacent st along last row of scarf, turn — 6 sts. Rows 4 through 17: Repeat Rows 2 and 3; do not drop loop on last row, instead join to adjacent corner with a Sl st.
That’s it! Now you’re ready to wear. Just fasten with your favorite shawl pin or brooch or with a set of pretty screw on pedestal buttons (as shown here) or magnetic button closures. 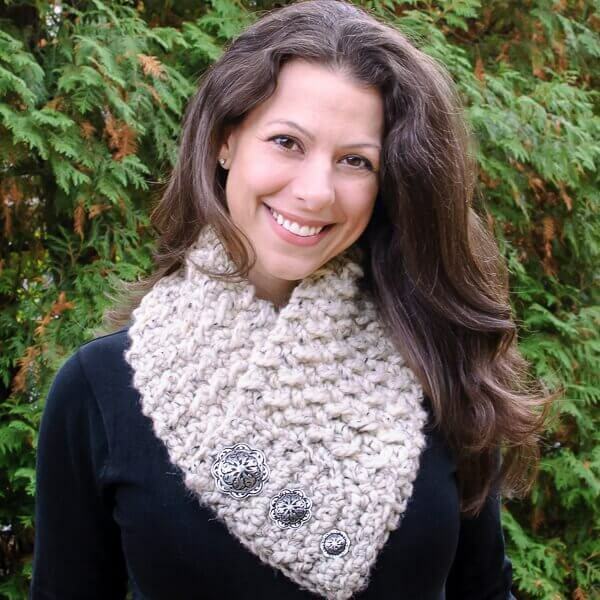 Like this Quick and Comfy Crochet Scarf Pattern, but prefer knitting? I love your pattern and I’m at the end to do the last ribbing and feeling a bit lost. Do you have something to show what the dropping the loop and connecting to adjacent looks like? I don’t think what I have going on is what it should be at all! Do you have a photo of that last end started maybe? Help please. I’m so confused on the very first part. Rows 4-17. I don’t understand where to put the sc stitches after doing a row of slip stitch. I tried putting them over the top of the stitches but it doesn’t work out to well. Is this what I’m suppose to do. So confused. ..
Work the single crochets right into the loops of the slip stitch. It is supposed to look like a tight knit ribbing texture. I just finished this scarf, and absolutely love the pattern. Thank you for sharing this lovely scarf pattern. I’ve been following you for a while & love all your crochet designs & patterns, including this one. I’ve been looking for this type of “neck” scarf to make & this is perfect. It looks nice & warm, just what I need for these cold Pennsylvania winters. I can’t wait to make one. Thanks so much for sharing your talents with us all. May I sell this scarf in a local shop where I have items that I have made? Hi Kara. I finally figured out where I was going wrong after tearing my scarfie apart many, many, many, many times. I was reading the crochet pattern incorrectly and doing the same pattern on both rows 2 and 3. What a dummie. I could have saved myself at least five weeks of headaches if I had just noticed sooner. It is now coming along splendidly. Thank you for your patterns, your help and your patience. I can hardly wait for the fingerless gloves. Much thanks. Hi Jackie 🙂 Not particularly, I just tried to place them so they were evenly spaced across since they wouldn’t divide into the Sl sts or the sc rows evenly. Hi! I love this scarf. I actually just finished and I have a question. Are the buttons supposed to unlatch or are they supposed to stay secure and you slip the scarf over your head? Thank you so much! You can either use a shawl pin or pedestal buttons as I used here. Both options are removable. Hello Kara, Your scarf is amazing and it’s very quick. Thank you for this pattern. I am making one as a gift, but i have doubts about attaching the buttons. The ones i found here (in Bulgaria) required a hole. Can you please advice me. Thank you very much. This looks very comfy! And warm. Beautiful piece. Would the pattern work with regular Wool Ease (not Thick and Quick) or Classic Wool if I held 2 strands together? The pattern is beautiful. thanks so much for sharing! I tried to print out this info for this scarf but couldn’t. This is really beautiful! And inquiring minds want to know…where did you get those gorgeous buttons!?!?! 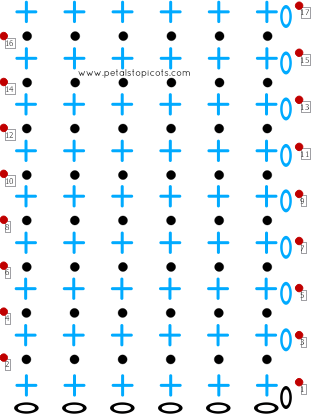 Thank you for sharing this wonderful pattern! 🙂 I can’t wait to make it. I love this. Where could I find the buttons or similar ones? Any chance of a knit version??? Lovely scarf, lovely you !!! This pattern is absolutely gorgeous (as is the model). 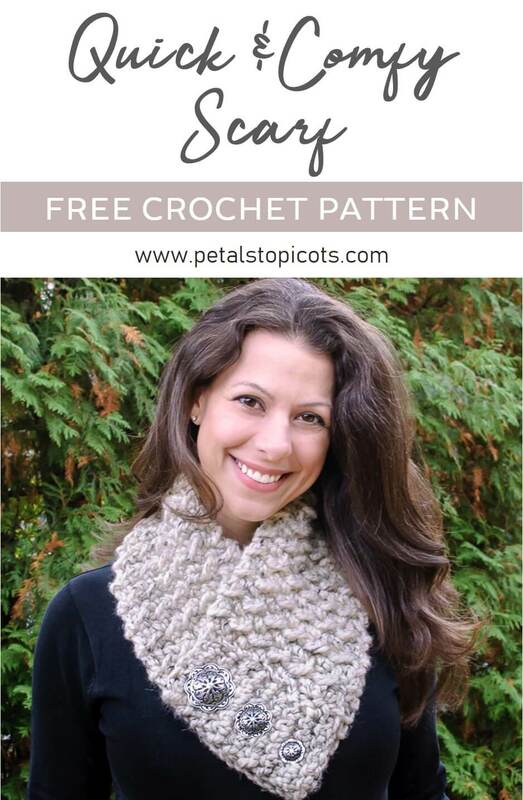 Thanks so much for creating this scarf and sharing your pattern so we can all make one! I just signed up for your “patterns to your inbox” newsletter and, amazing, that’s what you get. No having to click, then download…simply a pattern in my inbox. Thank You!!!! Should say great pattern. I signed up because when I checked out your site for the little birdies, I saw you have such imagination! Keep up the good work. This is wonderful!! I was afraid this post might have been from last year, then I saw Preeti’s comment date!! Thank you for sharing such an awesome and beautiful pattern!! The scarf is pretty,I would like to crochet the other things but I HATE CHARTS!